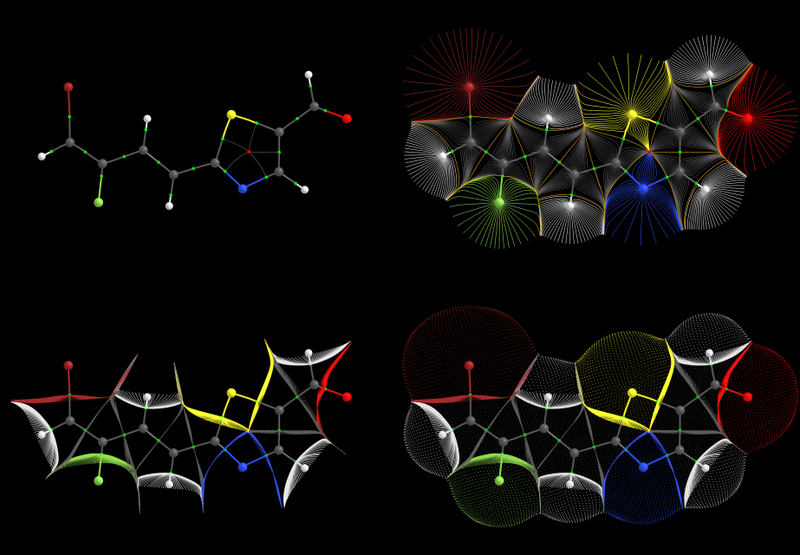 Representations of the isolated molecule 5-formyl-2-(3-fluoro-4-bromobutadienyl)thiazole in terms of features of the gradient vector field of its electron density distribution. Atomic basin and interatomic surface gradient paths that extend to infinity are visually truncated at the molecule's 0.001 a.u. isodensity surface, which is shown in the bottom right image. Calculated and displayed using AIMAll together with a g09 ab initio quantum chemistry wavefunction (HF/6-311G(d,p)//HF/6-311G(d,p)). AIMAll is an easy to use, accurate, reliable and efficient quantum chemistry software package for performing comprehensive, quantitative and visual QTAIM analyses of molecular systems - starting from molecular wavefunction data.